`Compacta', Kingsville Dwarf boxwood, makes a fine groundcover when mowed 3 1/2 inches high every two years in early to mid spring. Height to 12 inches, spread to 4 feet. `Japonica' has light green leaves up to 1-1/2 inches long. Height is to 6 feet. `Koreana' is perhaps the hardiest littleleaf variety, growing into western New York and the Ohio Valley (zone 4). Height is to 2 feet tall. 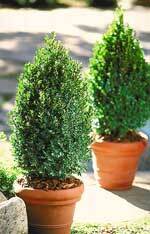 ‘Green Mountain’ - Grown by Monrovia Nursery, the variety Green Mountain is a vigorous growing boxwood when young. It has dense upright form with bright green leaves that retain their color through winter. Natural cone-shaped form if left unsheared, excellent hedge. Evergreen. Full to partial sun. Moderate grower to 5 feet tall, 3 feet wide. This offering is for single plants of this variety. These are growing in 2.5 inch containers and are 6 to 10 inches tall. Popular specimen plant offers narrow, lustrous dark green foliage with white variegation, on a dense, multi-branched form. Reaching 5 feet tall and about as wide, excellent used as an informal screen if left unclipped. Tolerates pruning well for use as a hedge, in topiary work or formal gardens. Does not do well in alkaline soils or hot dry areas. Grow to 3 to 5 tall and wide. Zones 6 to 9.